Recently I noticed that my Gmail (actually in my case G Suite ) has been ignoring the 'Skip Inbox' option on all of my filters. Even though I had several filters set up to move emails out of the Inbox and archive them, they kept on staying in the Inbox. Turns out there is a setting that controls this! Under 'Settings' in the 'Inbox' tab there is a section for 'Filtered mail'. 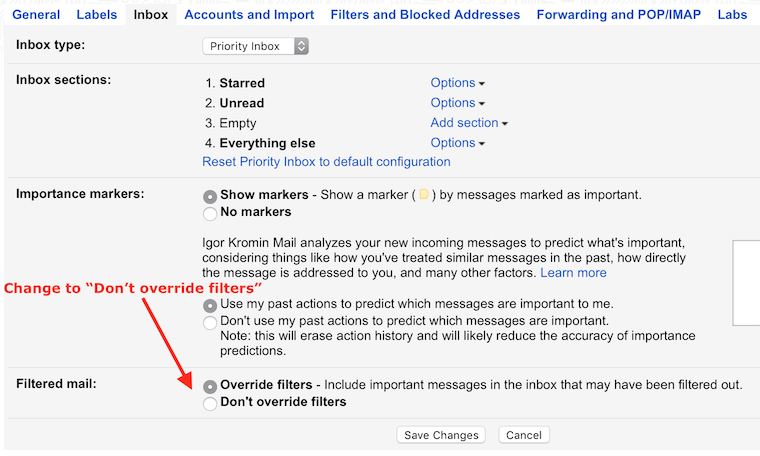 There is a setting there that can force filters to be overwritten for important messages to make them remain in the Inbox even if the filter is set up to 'Skip Inbox'. All you have to do is select the "Don't override filters" option and "Save Changes". This will make sure that filters work as expected.